“By virtue of the Creation, and still more of the Incarnation, nothing here below is profane for those who know how to see.” Teilhard de Chardin. Here too the Resurrection is prefigured—not only the Resurrection of Him who shall stand at the latter day upon the earth, but also of the whole of humanity who in the flesh shall see God. Sight has always been understood not merely as a physical faculty, but as a spiritual power. We speak of the mystics as seers or Rishis, as those who have visions. Primitive man did not distinguish the Spirit from the body. For him, for example, the physical phenomenon of fire was also a spiritual energy. Thus sight that has as its object the physical, was easily understood as also reaching out to the spiritual. It was not that two separate operations or faculties connected merely analogically, were being spoken of; one a sensual perception, the other a mental or spiritual one. The same understanding which conceived of the spiritual as intimately integrated with the physical, as essence to substance, could easily comprehend the sensual faculties as also spiritual ones. Thus to see fire was also to have a vision of the god Agni. The disciples who saw Christ with their sensual organs, saw him at the Transfiguration, in all his spiritual splendour. Their seeing was not a totally different form of vision from what we ordinarily mean by sight, but it was the same sensual faculty, extraordinarily extended in power, so that it now could penetrate beyond the substance to the very essence itself. “Sight” has been divided into the physical sensation of light, and objects in the light, and the mental recognition of the meaning of what is seen. But it has been forgotten that perception is the integration of physical sensation with mental recognition, in a homogeneous impulse. In the actual operation of seeing, the mental and physical cannot be compartmentalized. To distinguish between them is only meaningful if we always bear in mind that the distinction is not actual, but only latent. Sensation and cognition, body and spirit, are coefficients of a single actualized moment of vision. They indicate the potential of vision, but they cannot divide it. There is vision which is merely sensation, in that its total potentiality has not been fully realized. Thus there can also be vision which is extended in power by the cognitive faculty, but still does not penetrate to the core of reality—such might be the vision of the scientist, who seeks to know what he sees. But the full potential of the actual moment of sight is only fully realized in one who sees not merely with the body, by sensation, or the mind, by cognition, but in the very Spirit, by mystical insight or vision. 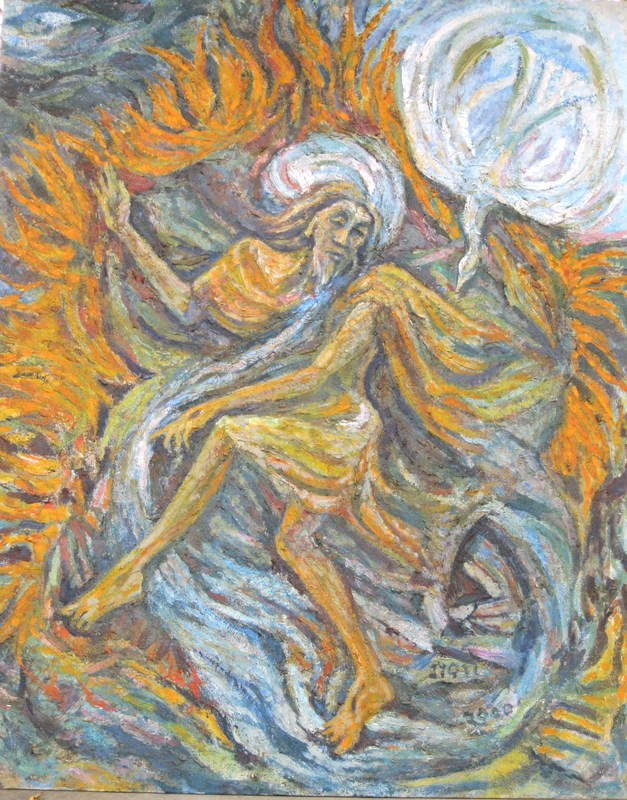 Not only is the physical faculty of sensual perception capable of an extension in power, so that it is able to penetrate the spiritual, but also the very physical recognition of spiritual reality, touched upon by those who witnessed the transfiguration, is an essential support of the spiritual reality which has infused the body. We believe in Christ, and this was the constant cry of what we might call the Apostolic Tradition, not merely because the spiritual truth he annunciated had the vigour of Eternal Truth, not merely because he was a Teacher and a Prophet, but because in him the disciples saw the Spirit transfiguring the phenomenological world in the form of a Divine Splendour. Thus St. John proclaims faith in Christ with the authority of one who has seen and felt the reality of the Word of Life incarnated in the world of substance. LIGHT, THE MEDIUM FOR VISION. Sight, as any other faculty of the senses, requires a medium. If the medium is limited, it inevitably limits the faculty. However strong our power of sight, if the light is dim we see imperfectly. If the medium is temporal, then our vision is temporal too. The medium of the world is by nature temporal if we understand by the “world” that which is merely physical—for the very nature of the physical is that it is hemmed in on all sides by limitations. Thus the sight which depends on physical light is bound to come to an end. What we should strive for is a sight which reaches beyond the physical to penetrate the spiritual. Once the dimension of the Spirit is reached (albeit in and through matter which is never to be understood as separate from the Spirit, though, however, distinct) then vision is eternal. We have tried to maintain a unity in all thing. There is a unity of matter and spirit, and also in sight there is a unity between what is sensually seen, and what is spiritually perceived. But there is also a unity between what we can perhaps call the perceiving thought, and the objective reality which is perceived between the seer and the seen. Thus, our vision of phenomena is closely integrated with the phenomena. This in the case of a change in vision, might appear to indicate a change in the objective reality which is seen. To see all things as resurrected in Christ, is to find all things restored in Him. The miracles of Christ effected a change in the corruption or unrest of the phenomenal world. He is described as “looking” upon the distressed, or turning to “gaze” upon the troubled ocean. When he saw the faith of those who sought him, he was moved, and his very vision of them, one could suggest, worked the miracle. Was the miracle, after all, just an example of profound auto-suggestion; the miracle-worker no other than the subjective consciousness of the one who saw the miracle? We forget that the existence of man extends simultaneously on the levels of the three worlds; and only in one of those worlds is he effected by disease, death, and all other manifestations of change. What is revealed by the miracle is not a reversal of the workings of nature, but a deeper penetration into them. We see in the miracle not merely the segment of reality which we call “this world”, but the total reality embracing all the worlds in the eternal now. In this total reality, no man is sick, no man dies, no oceans are troubled by storm. To see the world in its true spiritual dimension, as alive and resurrected in Christ, is already to cure its ailments. The miracles of Christ, are, like the Transfiguration, signs of the Resurrection. Those who look upon our Lord, those upon whom our Lord looks, somehow break through to a new vision of themselves and the world around them in the light of Christ, wherein they realize their essential resurrected body. Accepting this essential idea that the body is already resurrected in its inner spiritual reality, the question often strikes us is how the world as we experience it with our senses, is so conditioned by suffering and infirmity? Above all, why is our involvement in the physical phenomenological world so prone to hold us back in our search for the inner kingdom of the Spirit? We could say that there is a certain gravity—a downward pull—in the world of phenomena which seems it work against our search upwards towards the spiritual kingdom. This, I feel, is because man is destined not only to find in the world a medium through which he reaches towards God, but to be a medium (ie mediator) himself, so that the world might travel through him through the successive stages of his own spiritual evolution, to fulfilment in God through Jesus Christ. But, on account of our fallen nature, and concupiscence, human beings hold on to the world and do not allow nature to pass through human consciousness to discover a new spiritual integrity. Insofar, then, as mankind holds on to the world and refuses to allow it free passage to a higher reality, the world blocks the spiritual progress of humanity, and clogs up the very apertures of our physical perception of the reality in which we live. A bad medium soon becomes saturated, for its power to dissolve is limited, and then there is a mounting sediment. The function of man is to dissolve the world in the pure medium of a spiritual evolution. In the Resurrected body, matter is perfectly held in solution by the dissolving power of the spirit—the spirit at once dissolves matter, and solves the terrible problem of the tendency to separate from the spirit through gravitation, by maintaining and holding it in a perfect unity with the soul. This position which humanity holds as a mediator between the Creator and Creation is, as St. Paul outlines, on account of the human being made in the image of God; an image which is fully restored in the person of Jesus. Mankind, in whom this image is enshrined, is not to be understood in separation from the rest of the phenomenal world, for the divine image which humanity represents, is a gift entrusted to mankind on behalf of the whole creation. This gift is not a possession, but rather is something to be shared. Ultimately speaking the whole world, of which man is the evolutionary apex, is incorporated into this mystery of the image of God, in that the whole of creation is a true icon of the kingdom in which the Spirit of God reigns. “We imagine that in our sense-perceptions external reality humbly presents itself to us in order to serve us, to help in the building up of our integrity. But this is merely the surface of the mystery of knowledge; the deeper truth is that when the world reveals itself to us it draws us into itself; it causes us to flow outwards into something belonging to it, everywhere present in it, and more perfect than it. Pensees 5—Hymn of the Universe. The Resurrection as a way of seeing. Ultimately the world dissolves, becoming subtle and transparent, at the very point when our vision, penetrating right through its very substance uncovers the inner reality of the Spirit. The Resurrected body is not an ethereal body, a body without substance, but rather a body whose substance has ceased to become a hindrance to vision, a body through which we can look to the pure light of the indwelling spirit. Sight which uses the merely material as a medium is divided by subject and object, time and space. There is the seer and the seen, and the sight which should unite the two only emphasises the width of the gulf between these opposites, that condition our present way of perceiving reality. Ultimately sight in the merely physical sense becomes another form of blindness, for what we see is nothing other than the medium—beyond the medium no object is revealed. Thus if we look at a tree we do not see the tree but only the physical light upon it. The true medium on the other hand reveals the world in itself. Further, in that medium there is no division of subject and object, time and space, for all are united in the One Light that manifests the unity that underlies the whole of Creation. Unlike the physical light which reveals the world in which we live, we cannot see the True Light, because it is beyond the senses. But it is this True Light that gives meaning and ultimate value to the physical world of our natural environment. We discover an inner eye, or spiritual way of seeing, when we intuit the presence of a light that illumines objects from within, through which the secret of reality is unveiled. We might ask whether if it is true that the Resurrected body is indeed present already in the heart of the world? The carnal body which is before our physical gaze, is surely not just an illusion. Going beyond the phenomenal world, we may have to maintain, like the Hindu Advaitin, that there is no such thing really as suffering, darkness, blindness, or death in the world. The only reality is this inner vision where all is united by a divine consciousness. As in a dream we see things which cannot be substantiated in our waking state, we might suggest that the appearance of things as we see them in the physical light of phenomena, is merely insubstantial, a mirage. The true body, the true substance which is united to the Spirit, is never seen at all. Here again we would, whilst trying to maintain a unitive outlook, be forced to concede the terrible division of physical perception as we know it in the light of phenomena, and spiritual perception whose medium is the light of the Resurrection. C.J. Jung among many others, always energetically maintained the reality of dreams, despite the fact that they cannot be related to the phenomenological world. Perhaps a concept of various layers of reality is called for, like the various layers of the onion’s skin, each layer distinct in itself but formed around an inner central reality which for us is the central reality of the Resurrected body. Thus the suffering, darkness, blindness, and death which we witness in the phenomenological world, has a reality, but the reality is only to be understood in relation to the central reality of the Resurrection. The reality of all that is corrupted, incomplete, contained, points to the reality of a condition separated from the true vision of the innermost mystery, a condition of blindness and obscurity, of concupiscence and immaturity. But in and through all this it must be remembered that God is the God of living things. All things in the world, however they might appear to us in the world, are in fact living, pure and perfect in God. That is, in God all things already have their risen bodies. Incarnation as a cosmic vision. Christ entered into a particular historical time, and not only into the totality of evolutionary time, as he is conceived of as doing in the Hindu Avatar theory, where the successive incarnations of God represent the divine penetration into evolving stages of phenomena. The divine Word assumed the lineaments of a particular cultural heritage, clothed in the form of a particular human being. In our contact with the phenomenological world it is the particular and localized reality that strikes us most about things. In fact too often it is the particularity of things which seems to stand in the way of our knowing their inner reality. The Platonists held that we cannot know except through universal principles. It is here above all that our physical senses seem to be hopelessly useless for spiritual insight, in that the physical senses, as is well known to the artist, can only perceive the particular. There is no sensual faculty which can perceive the universal. It is, I feel, on this account that physical, sensual perception has been divorced from spiritual perception in the thought of many philosophic schools. The imagination has to be based in the here and now of a lived reality.But yet, I feel, the problem of imagining a spiritual world underlying our immediate experience of reality around us, is only apparent. In fact it is in the perception of the particular that we witness above all the mystery of that transformation of sight typified in the event of the transfiguration. The more minutely we concentrate upon the particular in things, we find the substance dissolving to reveal the cosmic. Thus heaven is found in a grain of sand, the universe in a leaf. The abstract painter who restricts his vision to a texture of rock or organic substance, discovers the evolving patterns of stellar space. Thus the Cosmic Christ of the Resurrection is not a denial of the particular Christ of history, but a vision of the inner reality from which day after day, the minute, down to the smallest atom, is concretized. It is precisely because the economy of God’s salvific plan began with a “kenosis” by which the Eternal Word was incarnated as a babe, having all the fragility of the fragmented, that the same economy led with unfailing certainty to the Ascension whereby Christ assumed His place as Lord of the whole cosmos, the Pantocrator. The particular tension which Christian art struggles with, is to discover the reality of the Resurrection within the suffering and humiliation of the Cross. The Resurrection does not turn the harsh truth of human suffering into a mere illusion—something that can be forgotten in the light of a transforming spiritual experience. The same tension is found when we try to see the universal, or cosmic lying hidden in the particular and local. When we speak of the Resurrection as a new way of seeing the world in which we live, it is by accepting the strange paradox of what is eternal enshrined in what is temporal and finite. The divine, we affirm, is present in the human heart, but also in the heart of the world as we perceive it with our physical senses. A spiritual art based on the resurrection cannot be an other-worldly art, but needs to affirm that it is in this world, with all its limitations, that we can break through to a cosmic vision that gives meaning to all that we experience in our bodies. The Resurrection is in fact an affirmation of a truth that lies buried in the phenomenal world, like a seed hidden in the dark matter of the earth. It is only in the light of this way of seeing that we can hope to recognize the truth of Creation, but also our own role as mediators, and instruments, participating in a process whereby the Creation is coming to birth through our own perception of what Reality means, in the light of our present historical situation. This entry was posted in Uncategorized and tagged Ascension, Christ, Christianity, Church, Creation, Easter, Genesis, God, Gospel, Hymn of the Universe, Incarnation, Jesus Christ, Job, Jyoti Sahi, Light, Mount Tabor, Pantocrator, Platonists, Resurrected body, Resurrection, rishis, sight, Spirit, spiritual, St John, St Paul, Teilhard de Chardin, The Cross, Transfiguration, vision, Word and Worship. Bookmark the permalink.